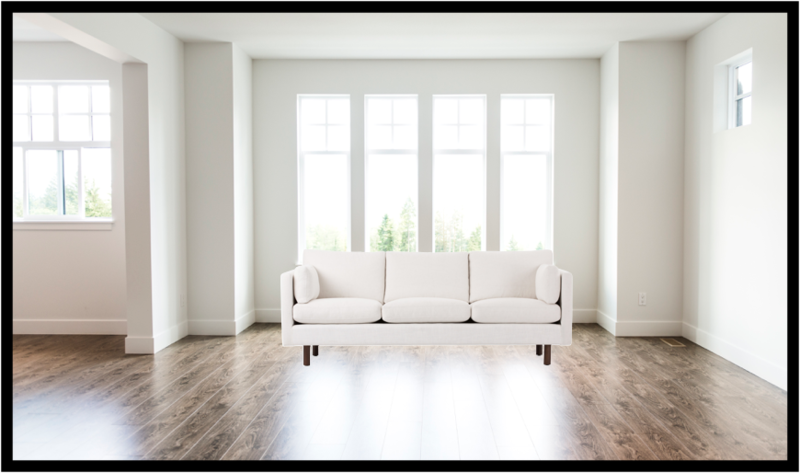 Your home tells your story. How do we ensure that you get the home that fits your life and style best? We ask lots of questions, and then have an open line of communication with you. 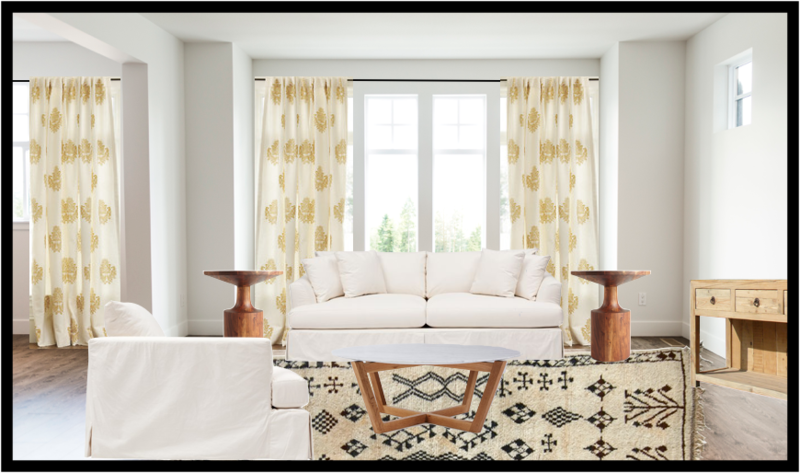 There is no limit on emails, or revisions, because we going to ensure that you are 100% in love with your home, and we do that by getting to know you, and incorporating the pieces you love, sourcing what you need, and pulling it all together in the way that works best for you. 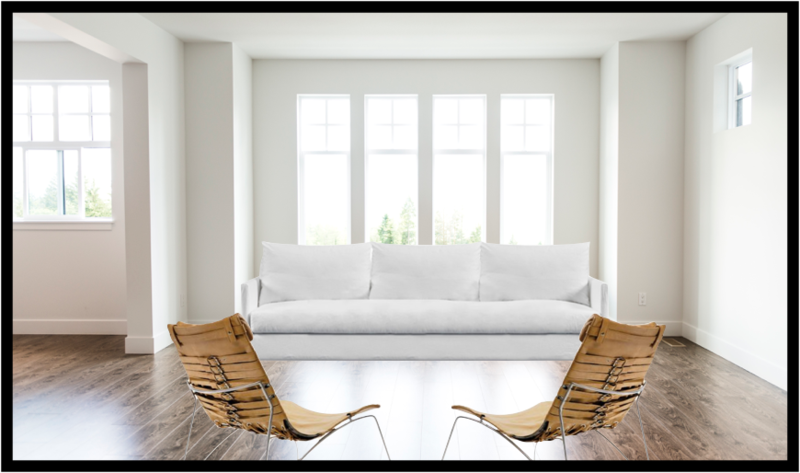 Below we have taken some of our real life clients (names changed), and created design boards for the same space, each starting with a white sofa that the client owned previously. The end results vary drastically, as you will see. 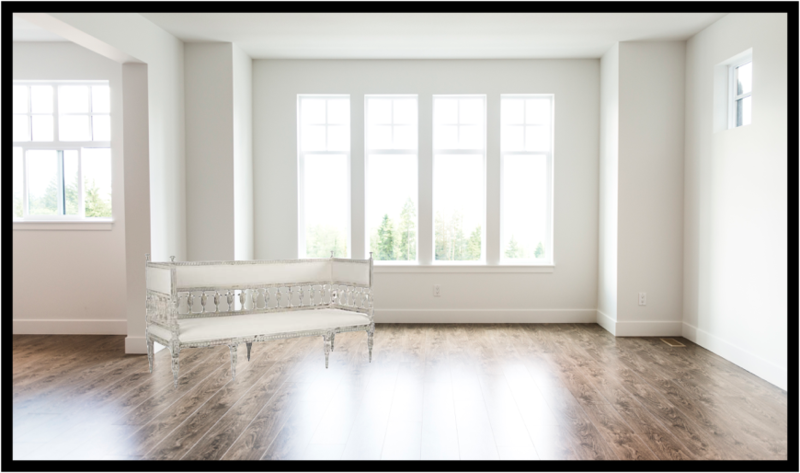 This illustrates how each clients needs and style are considered, and how we work to ensure you love the results! A low, slouchy sofa provides that Cali cool that Jess wants, and leaves plenty of space for her friends and new puppy to lounge. A pair of modern stools in a fabulous sky blue and airy white bar table set the tone for the room and provide a small eating/working space tucked into the living room. 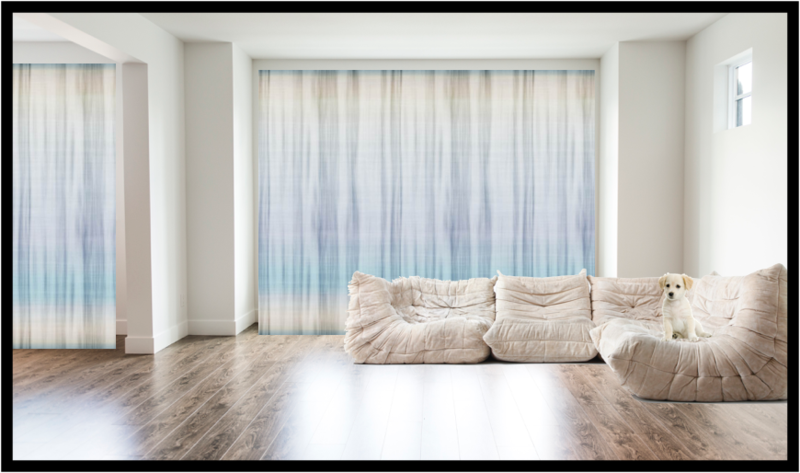 On the windows subtle ombre blues on natural loose woven linen creates a flowing backdrop of filtered light, and can be easily pulled back if Jess wants to let a little more sunshine in. A low storage unit in the dining are provides storage for Jess’s yoga equipment and her extensive record collection. A neon light radiates youthful positivity into the space, reflecting the restful vibe we created here. “I’m Sarah, a gardener who has chosen to live out in the desert! I love to make things with my hands, and paint, sculpt, weave etc.. in my free time. I have storage for all that, but would like a place to hang my giant brass mobile and place a small easel, yarn basket, whatever I’m currently working on. I tend to bring home broken furniture and try to fix it, my home is just too rustic. I need someone to help me dress it up a little, without losing the artsy feel. 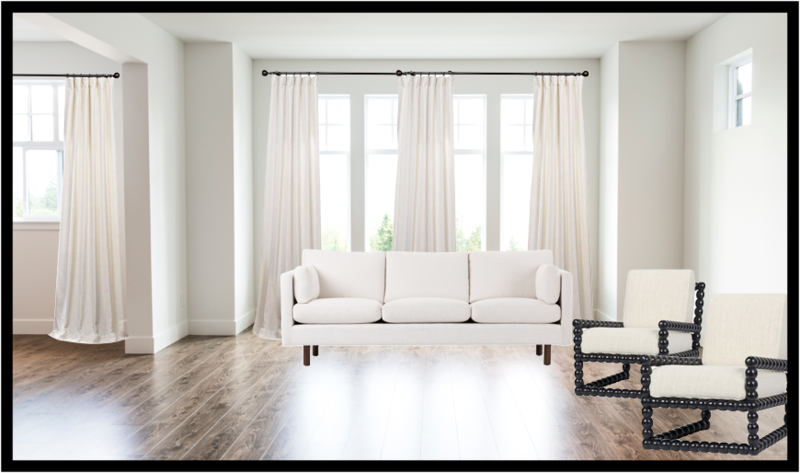 Sarah loves a quirky piece, and so we are starting off with a very simple sofa in natural linen upholstery as a base. 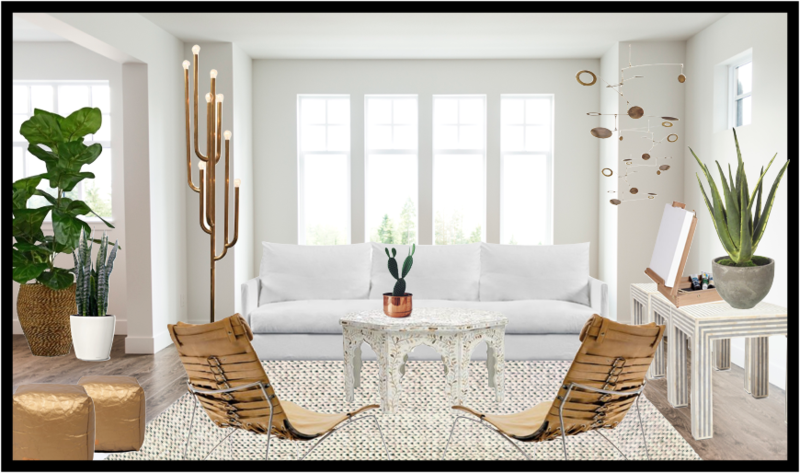 Two vintage camel leather chairs that she recently purchased will fill out the seating area and the arrangement is set up for easy conversation. 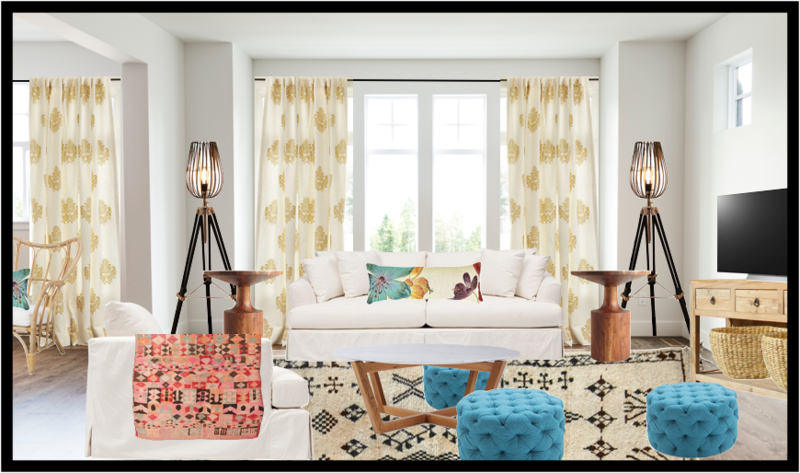 An inlaid coffee table and side table layer in soft pattern and color, without overwhelming Sarah, and provide a place for her projects to rest. Some metallic leather pouffes offer comfort when Sarah is sitting for extended periods working on a craft. 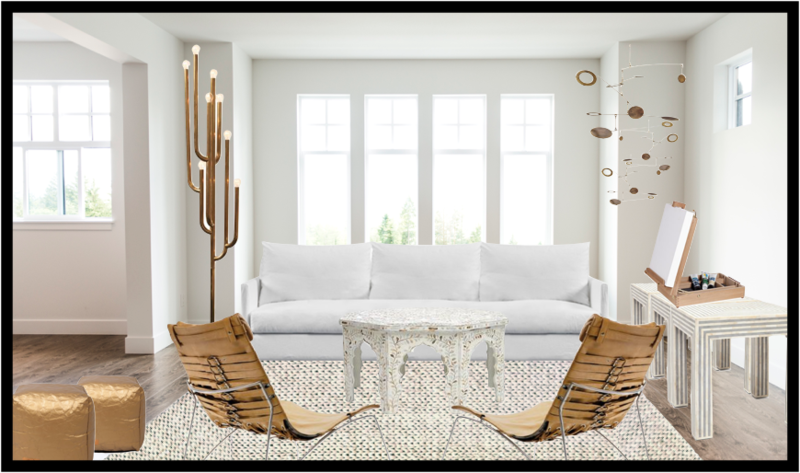 Her brass mobile shines in a corner of the room, and a fantastic vintage cacti lamp offers a sculptural element and plenty of light in the evenings. As promised, plants filling the nooks and crannies of the room. 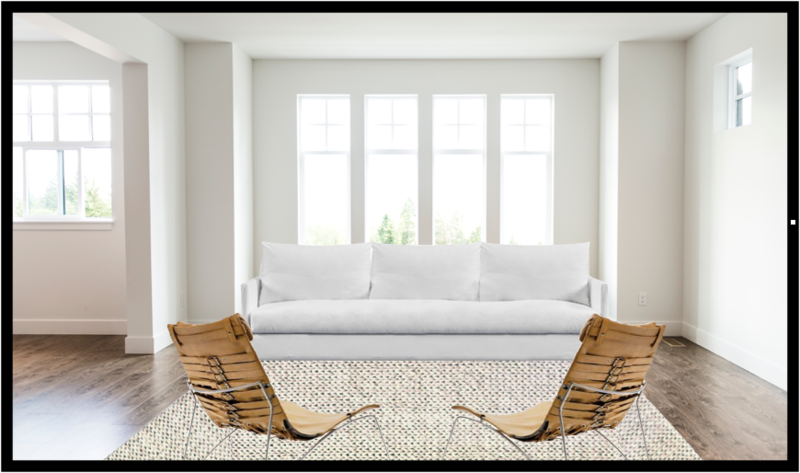 A braided rug in off-white wool add a layer of comfort for bare feet, this is space to kick off your shoes in! “Hello, my name is Eva. I’ve just left a job that required months of travel at a time, and so lived out of hotel rooms for many years! I’ve opened a small consulting business, and will working from home, quite a change. My husband and I live in the city, and have amassed a huge amount of antiques which we are currently sorting through. Eva’s smaller pieces offered a treasure trove of beautiful design. 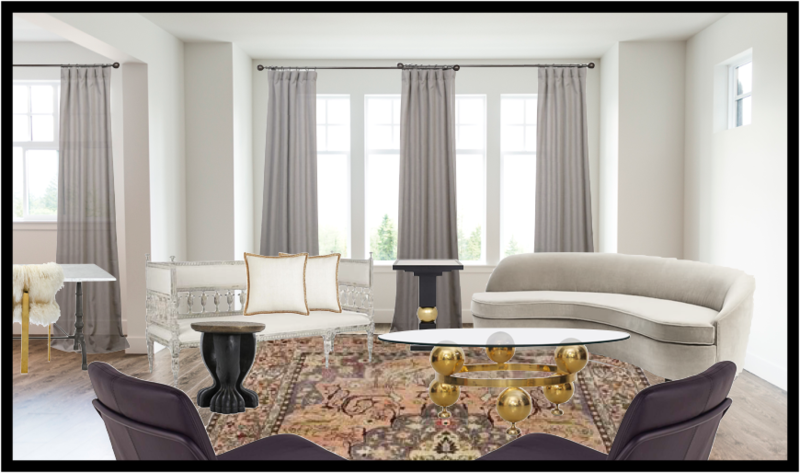 To balance all the interest, we started with a curvy velvet sofa in a beautiful warm grey. This shape and scale offer a corner piece, which can be placed opposite the vintage french settee. An antique rug that pulls in soft grey, plum, rose and gold tones sets the palette. 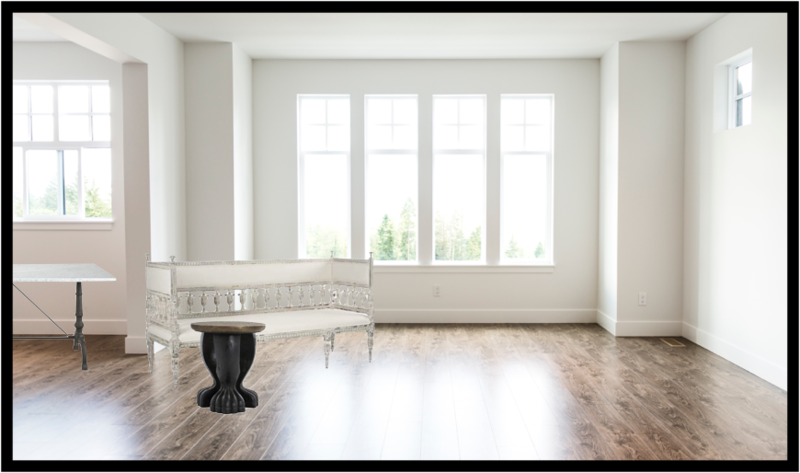 To round out the grouping a pair of bold modern chairs, upholstered in the deepest almost-black eggplant leather were added. 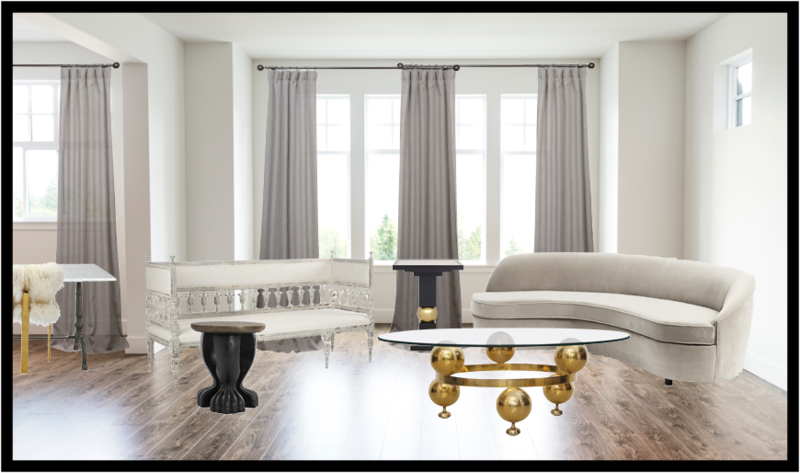 A black lion inspired stool and gold and black table punctuate the softer palette of the space, adding drama and interest. Eva’s favourite vintage brass coffee table sparkles front and centre. A unique floral brass tole floor lamp functions as art here, as does the glass deco chandelier. These will be magic in the evening, light glimmering from the brass against the rich greys and purples. Eva shipped home the marble and iron table from Paris, and so we used that as her desk with a playful brass and fur chair tucked in under. 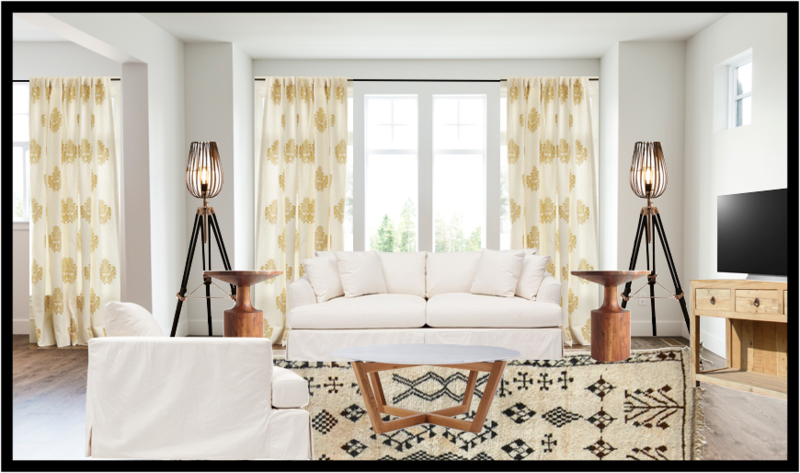 Tall silk draperies frame the generous windows and add an element of luxe. There is room along the walls of this sophisticated space for Eva and her husband to hang the many small, vintage oil paintings they have collected over time. 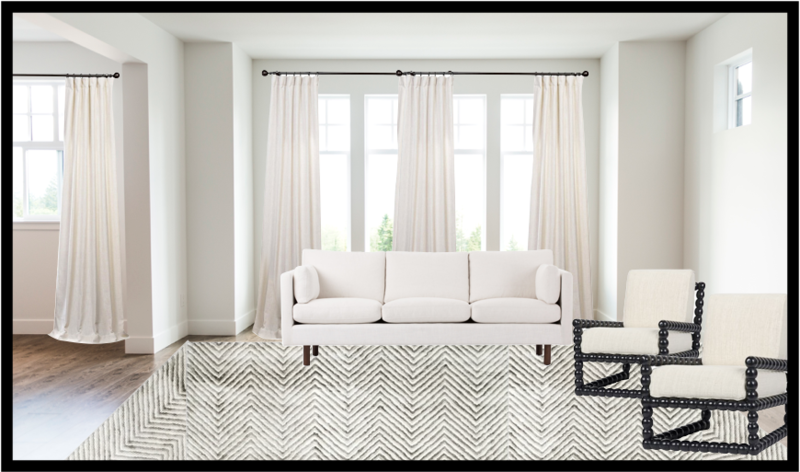 Mila’s sofa set the tone for a few mid-century accents, but we brought in some fabulous black wood framed armchairs that keep the black and white palette interesting, and the woven upholstery on the seats are very textural. 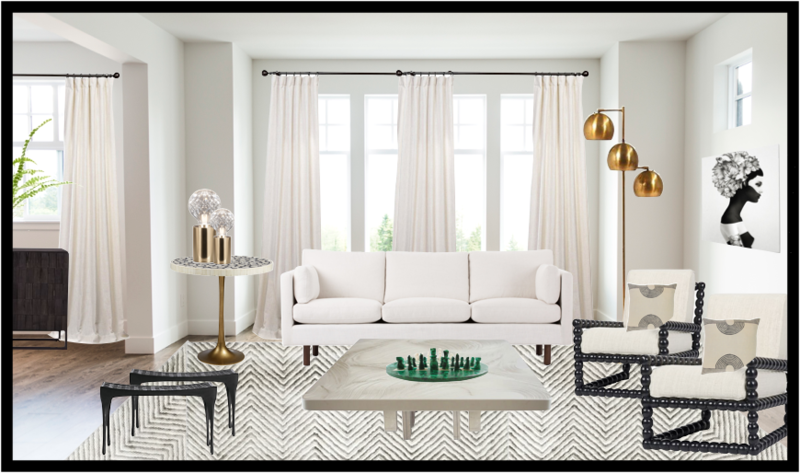 A low, large sold marble coffee table offers a generous surface for drinks and food while Mila entertains in the evening, and can display her Grandfather’s chess set during the day, a small concession to the no color rule! 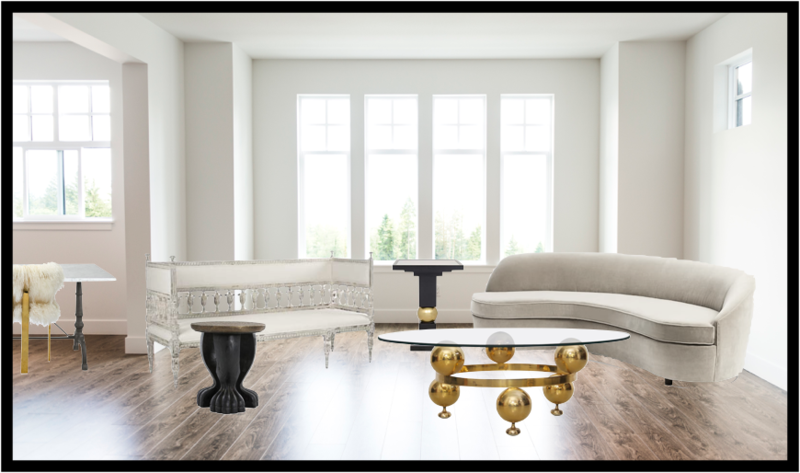 Low sleek ebony stools are hand carved but clean-lined, and the stone-inlaid top of the cafe table is balanced out by the bras tulip base. A classic mid-century brass floor lamp again re-iterates the slight curve and warmth. Mila and her boyfriend can rotate his photography freely along the walls, which are completely open. 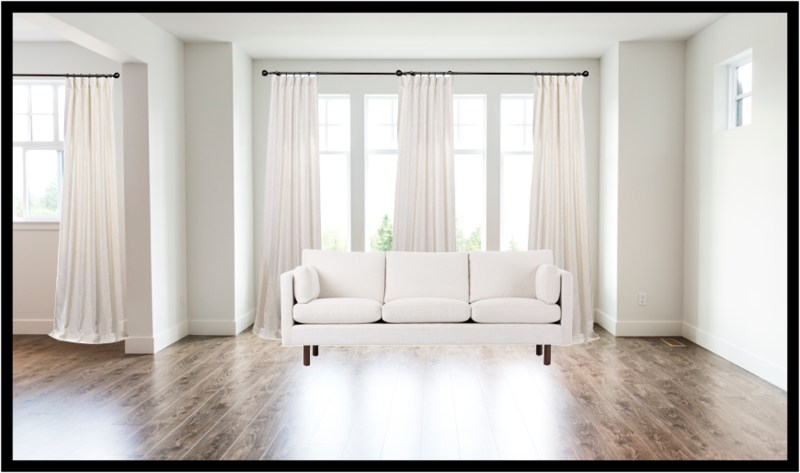 White curtains that break softly on the floors layer in an element of warmth, without visual distraction. 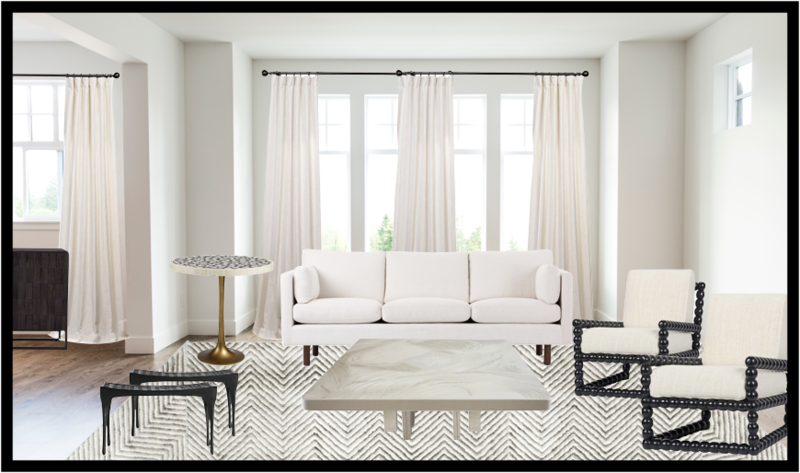 A clean, tailored black and white space where the materials and form offer a welcoming, warm atmosphere. 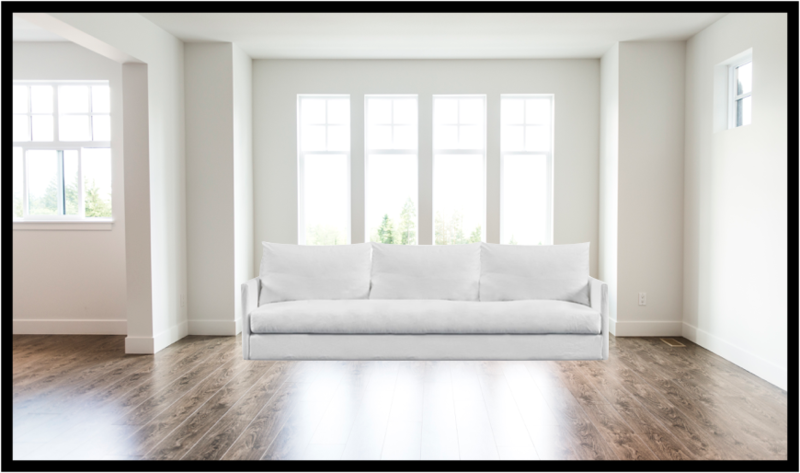 Aly’s choice of slipcovers for her sofas was perfect, even with such large pieces the room will be airy and they can be washed as often as needed. A sideboard offers a place for the tv to rest, where little hands will not reach, and there is plenty of toy storage here. 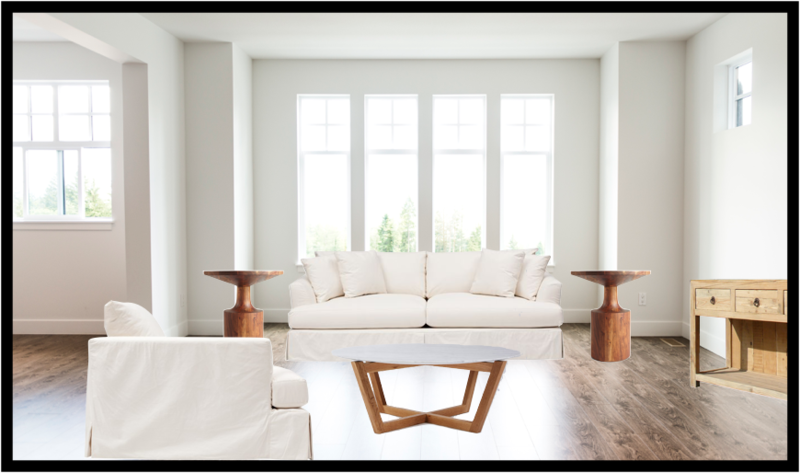 We added solid teak side tables with beautiful forms, and a large low round (no corners to bump little heads on) teak and marble coffee table that the kiddies can use for playing and snacks. Three ottomans in a vibrant turquoise offer seating for the little ones around the coffee table, and fort-building supplies! 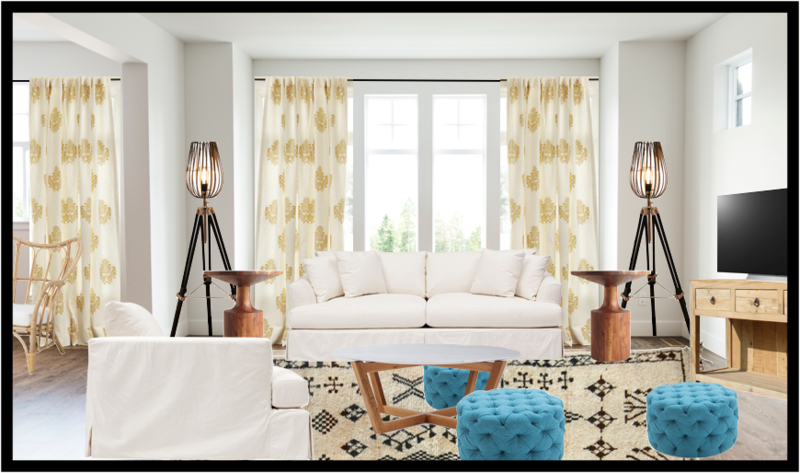 To bring in the color and pattern that Aly craves we added lush full linen block-printed panels on the windows. Long sofa pillows are custom made in a barkcloth Aly brought back from Hawaii years ago, and her Grandmother’s quilt tucks in over a sofa arm for chilly evenings. 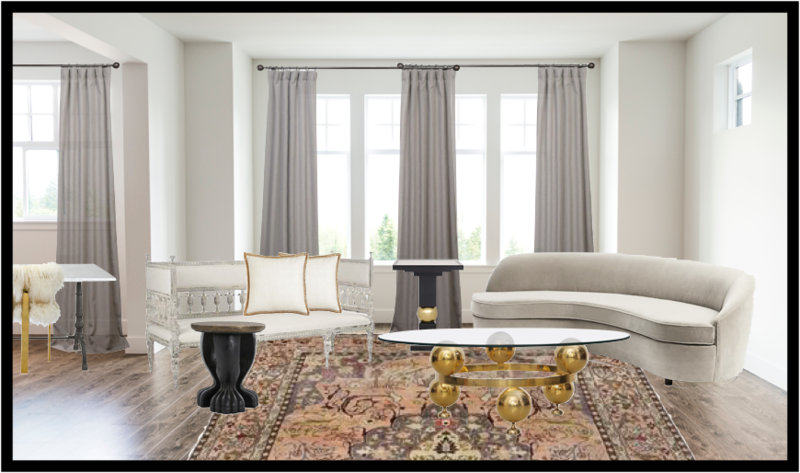 A vintage moroccan wool rug is durable and soft underfoot, but not too precious. The unique metal tulip floor lamps offer a little whimsy to the space, the black brings depth to the palette, and references the black curtain rods. 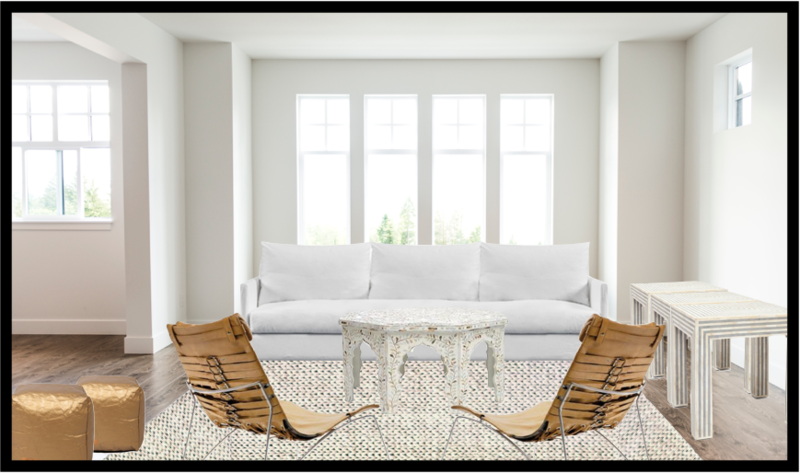 Finally, we tucked a pair of small armchairs into the dining room for Aly, a space where she can relax, with a friend if she likes, and still see the kids. 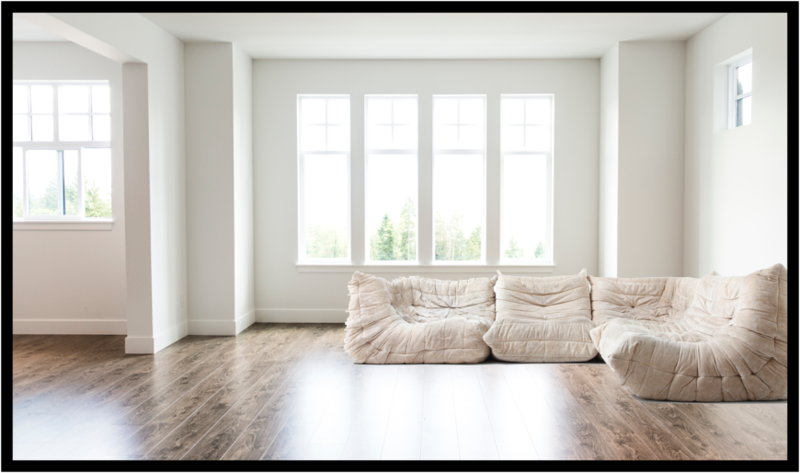 Creating a relaxed and child-friendly space does not mean you have to sacrifice personal style! 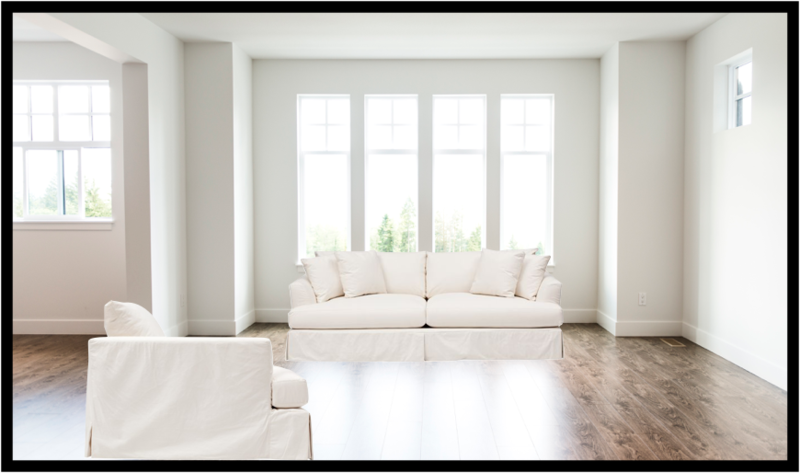 Your home tells your story. Ready to get started on yours? Fill out the design questionnaire today!